Offering you a new experience in sail training with luxury and attention to detail being at the top of our priorities for the whole duration of your course. These courses are ideally suited to the discerning person with family / friends looking for a bespoke sail training experience in a personal format with relaxation time incorporated, so that those along as company can enjoy the holiday environment too. You will have exclusive use of our beautiful new yacht, a Beneteau 55 Oceanis - "Kealani", (the name is Hawaiian meaning "Clear Sky"). She is equipped with every conceivable device to ensure your stay onboard is enjoyable and relaxing. Your own personal training course, tailor made to your requirements. 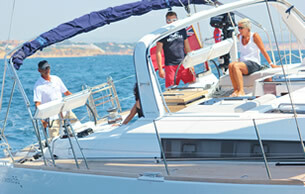 Ability to sail all year round in the warmth, blue skies and waters of the Portuguese Algarve. Exclusive use of a brand new Beneteau 55, in full specification and every extra. 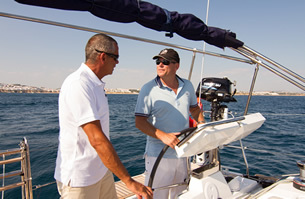 Your own personal Yachtmaster Instructor for the duration of the course. Not all work and no play, relaxation/downtime is built into the program. Training doesn't have to be in the cramped shared confines of a smaller cruising yacht. With Kealani we are able to offer the discerning client, space, comfort and an experience to remember. So, whether its to be a bespoke training course for you, your family / friends, a refresher or milebuilding experience that you might be after, Learn2Sail Platinum delivers. Call us today. As ever I learn loads each time I sail with you and this week was no exception.